KASHIWAZAKI, Japan - A strong earthquake shook Japan's northwest coast Monday, setting off a fire at the world's most powerful nuclear power plant and causing a reactor to spill radioactive water into the sea-an accident not reported to the public for hours. The 6.8-magnitude temblor killed at least nine people and injured more than 900 as it toppled hundreds of wooden homes and tore 3-foot-wide fissures in the ground. Highways and bridges buckled, leaving officials struggling to get emergency supplies into the region. Some 10,000 people fled to evacuation centers as aftershocks rattled the area. Tens of thousands of homes were left without water or power. The leak was not announced until the evening, many hours after the quake. That fed fresh concerns about the safety of Japan's 55 nuclear reactors, which supply 30 percent of the quake-prone country's electricity and have suffered a long string of accidents and cover-ups. About 315 gallons of slightly radioactive water apparently spilled from a tank at one of the plant's seven reactors and entered a pipe that flushed it into the sea, said Jun Oshima, an executive at Tokyo Electric Power Co. He said it was not clear whether the tank was damaged or the water simply spilled out. Officials said there was no "significant change" in the seawater near the plant, which is about 160 miles northwest of Tokyo. "The radioactivity is one-billionth of the legal limit," Oshima said of the leaked water. Eliot Brenner, a spokesman for the U.S. Nuclear Regulatory Commission in Washington, said the agency told Japan's government it was ready to provide assistance if needed but had not received any request for help. Brenner said he didn't have details about the incident. But a U.S. nuclear industry official, who spoke on condition of anonymity because the incident was a Japanese affair, said the transformer fire and water leak occurred in systems linked to different reactors. In Kashiwazaki city, the quake reduced older buildings to piles of lumber. Nine people in their 70s and 80s£­ six women and three men £­died, most of them crushed by collapsing buildings, the Kyodo news agency said early Tuesday. Kyodo reported more than 900 people were hurt, with injuries including broken bones, cuts and bruises. It said 780 buildings sustained damage, and more than 300 of them were destroyed. "I got so dizzy that I could barely stand up," said Kazuaki Kitagami, a worker at a 7-Eleven convenience store in Kashiwazaki, the hardest-hit city. "The jolt came violently from just below the ground." The area was plagued by aftershocks, but there were no immediate reports of additional damage or casualties. Near midnight, Japan's Meteorological Agency said a 6.6-magnitude quake hit off the west coast, shaking wide areas of Japan, but it was unrelated to the Niigata quake to the north and there were no immediate reports of damage. The U.S. Geological Survey put the intital quake's magnitude at 6.6 and the second at 6.8. First word of trouble at the Kashiwazaki Kariwa power plant was a fire that broke out at an electrical transformer. All the reactors were either already shut down or automatically switched off by the quake. The blaze was reported quelled by early afternoon, and the power company announced there was no damage to the reactor and no release of radioactivity. But in the evening, the company released a statement revealing the leak of radioactive water, saying it had taken all day to confirm details of the accident. But the delay raised suspicions among environmentalists, who oppose the government's plan to build more reactors. "The leak itself doesn't sound significant as of yet, but the fact that it went unreported is a concern," said Michael Mariotte at the Nuclear Information and Resource Service, a Maryland-based networking center for environmental activists. "When a company begins by denying a problem, it makes you wonder if there's another shoe to drop." The accident comes as the government is discussing improving the earthquake resistance of such plants, said Aileen Mioko Smith of the Japan-based environmentalist group Green Action. The fire indicated that some facilities at nuclear power plants, such as electrical transformers, were built to lower quake-resistance levels than other equipment, like reactor cores, she said. "That's the Achilles heel of nuclear power plants," said Mioko Smith, who pointed out that it took plant workers two hours to put out the transformer fire. Economy, Trade and Industry Minister Akira Amari told the power company early Tuesday not to resume plant operations before making a thorough safety check, Kyodo reported. The quake, which hit at 10:13 a.m., was centered off the coast of Niigata. The tremor made buildings sway in the capital 160 miles away and was also felt in northern and central Japan. Tsunami warnings were issued, but the resulting waves were too small to cause any damage. As rescue crews dug through the rubble for survivors or more dead, focus shifted to getting food and water to evacuation centers. 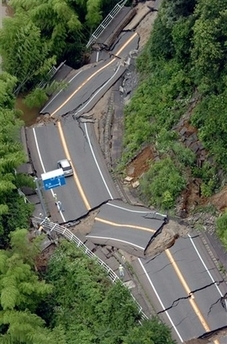 Many roads were impassable, though bullet train service to nearby Niigata resumed late Monday. More than 60,000 homes in the quake zone were without water, 34,000 lost natural gas and 25,000 had no electricity as of late Monday afternoon, local official Takashi Takagi said. Prime Minister Shinzo Abe, whose ruling party is trailing in the polls heading into July 29 parliamentary elections, interrupted a campaign stop in southern Japan to go to the damaged area. "Many people told me they want to return to their normal lives as quickly as possible," Abe told reporters in Kashiwazaki. "The government will make every effort to help with recovery." Japan sits atop four tectonic plates and is one of the world's most earthquake-prone countries. In October 2004, a magnitude-6.8 earthquake hit Niigata, killing 40 people and damaging more than 6,000 homes. It was the deadliest to hit Japan since 1995, when a magnitude-7.2 quake killed 6,433 people in the western city of Kobe. The last major quake to hit Tokyo killed some 142,000 people in 1923, and experts say the capital has a 90 percent chance of suffering a major quake in the next 50 years.